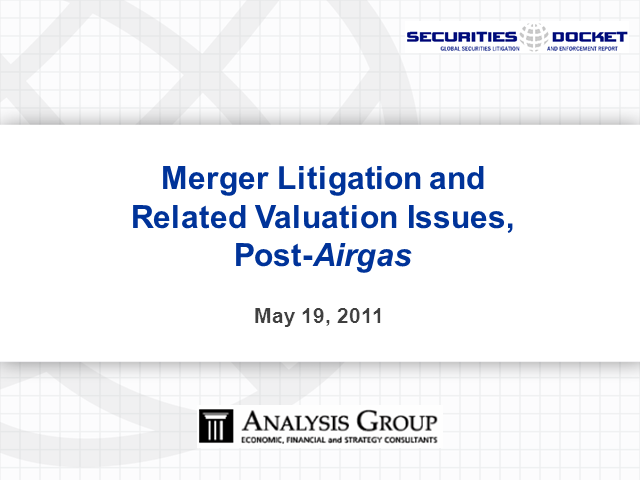 This webcast will focus on key issues – including valuation and corporate governance – in recent M&A-related litigation. The panel will address the types of valuation and corporate governance issues that are being litigated, and the potential implications of recent M&A rulings. They will also discuss relevant cases of note, including aspects of the landmark Airgas case (Air Products & Chemicals, Inc. v. Airgas, Inc). Mr. Kevin Shannon, an attorney in the Airgas matter, will address the legal issues, bringing perspectives from his role in the case. Professor Andrew Metrick, an economist and expert in corporate governance and finance, will examine the critical issues of valuation and corporate governance from an economic perspective. Mr. Gaurav Jetley, who specializes in finance- and securities-related litigation consulting, will moderate.